Below are some of the most common questions and answers that have helped people in their decision to place an esophagostomy tube. How invasive is the procedure to place an esophagostomy tube? The entire procedure typically takes 15-20 minutes to complete and requires a single skin incision no larger than 2cm. What are some complications associated with esophagostomy tubes? Complications with esophagostomy tubes are rare. One of the most common complications is infection of the area where the tube enters the skin. This complication is usually preventable if clients clean the area once a day. You can use gauze soaked in a diluted cleaning solution. It is important that you use a cleaning product approved by your veterinarian. Frequently this is a diluted solution of betadine or chlorhexidine, but your vet should either supply this or instruct you on what to buy. Do NOT ever use peroxide, alcohol or bleach as they can damage tissue. Does my cat have any activity restrictions with an esophagostomy tube? Cats with esophagostomy tubes do not have any activity restrictions. They can enjoy all of the same fun activities that cats without tubes do. Climbing, sink-laying, chasing their brothers and sisters, and catnip sessions do not need to change. What happens if the tube gets yanked out? This is a common fear that people have. They are convinced that their cat will somehow find a way to remove the tube, or possibly another cat in the house removes it. While it is a common fear, it actually does not happen very often. It can be best prevented by making sure you have secure bandaging or a collar wrap designated for this purpose. However, it is not an emergency if it does happen. There is no reason to panic. You simply need to take a breath, wipe the area with the gauze soaked in diluted cleaning solution (see #2) and come into your vet’s office to have the tube put back in. Will the esophagostomy tube prevent my cat from eating or drinking? The tube does not stop a cat from eating and drinking on their own. They can eat and drink as much as they’d like as well as taking treats! How long can my cat’s esophagostomy tube stay in? This depends on the type of tube used and its intended purpose. The silicon tubes made specifically for use as esophageal tubes can be used for years without needing to be changed. We are aware of cats that have had tubes in for more than 3 years. Some veterinarians will place the common “red rubber tube” that they stock for a variety of applications, and it is not intended for long-term use, and does not come a built-in luer adapter for feeding syringes. If you are considering getting a tube for your cat, it is worth discussing the type in advance with your veterinarian. In most cases, the vet can order the specialized silicon tube for you in about a day. The other variable that determines how long a tube stays in is its intended purpose. For cats with acute diseases like pancreatitis, or temporary conditions such a dental pain, they can have their tubes removed once they recover. Cats with diseases like IBD and chronic kidney failure can keep the tube in long-term. Is it uncomfortable for my cat to have an e tube? There is no pain from the site; the only reason for discomfort is if the bandaging is done improperly or too snugly. It is a little tricky to master getting the bandages just right. For this reason, it will be much easier for you to utilize a Kitty Kollar®, which is less restrictive (it does not require compression in order to stay in place) while still being secure, and makes it much easier for you to clean and maintain the site. The collars are adjustable, machine washable, and have Velcro to secure the tube. 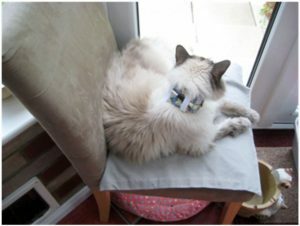 Many veterinarians stock the collars or they can be ordered at www.kittykollar.com. What are the real benefits of an esophagostomy tubes? Let’s break it down into 3 sections, nutrition, medications, and water. Nutrition: Nutrition is a very important aspect of treatment for feline IBD patients. It is common that an essential part of treatment of a particular disease revolves around a cat eating a specific diet. It is also common for cats to not cooperate and eat the diet that they need. (Imagine being sick with the flu and not wanting to touch a piece of food unless someone persuaded you to). Unfortunately, you cannot reason with your cat and convince them that eating the right food will make them feel better. In many cases, the esophagostomy tube is a temporary measure to provide adequate and appropriate nutrition until the patient feels good enough to eat on their own. Nutrition also plays a significant role in long-term diseases like chronic kidney failure. At times it can be difficult to convince a cat to eat a prescription kidney diet. 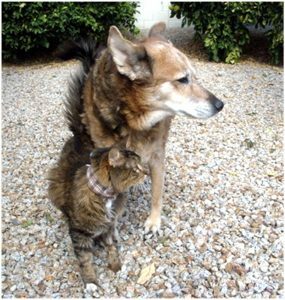 Cats don’t tend to listen, even if you give an in-depth explanation that the reduced protein, phosphorous restriction, and omega-3 fatty acid formulation will help him/her feel better. 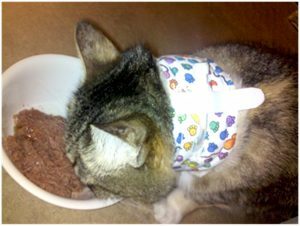 The esophagostomy tube allows you to provide adequate and appropriate nutrition, while allowing your cat to eat and enjoy other foods. The esophagostomy tube does not prevent them from eating food on their own. Medications: Another important reason to place an esophagostomy tube is because it makes administration of medications easy. You can administer most medications through the esophagostomy tube. Gone are the days where you waste time attempting to trick your cat by placing medications in a treat, shoving the medication in the back of their throat, or watching them run away and hide when they see you with the pill bottle. Treating a cat long-term with multiple medications can be difficult. The tube allows you to administer medications without a fight. The tube can even improve your relationship with your cat because you don’t have to struggle with medications anymore. Water: Cats with IBD may occasionally need hydration, but many of them have concurrent conditions such as heart disease and CRF. And cats that do not eat adequately are often dehydrated, as cats consume most of their water along with their meals. In the case of CRF, cats with chronic kidney failure have a decreased ability to concentrate their urine. One of the most common early clinical signs is an increase in thirst and urination. The reason they urinate large volumes is because their kidneys have a reduced ability to concentrate the urine. Early in the disease a cat does not become dehydrated, despite urinating large volumes, because they are able to drink enough water to compensate. As their disease progresses, so does what little concentrating ability their kidneys had left. This results in incredible volumes of urine and over time a cat simply cannot drink enough water to compensate and they become dehydrated. When a cat with chronic kidney failure becomes dehydrated their limited kidney function worsens and they start to feel very sick. At this point it is common for a veterinarian to recommend that fluids be given under the skin once a day to help a cat maintain hydration. Subcutaneous fluid administration is not an option for every cat. Some owners cannot stand the sight of needles, while others can’t imagine sticking their cat with a needle. Some cats absolutely hate subcutaneous fluid administration and simply will not tolerate it. Esophagostomy tubes allow an easy way to give extra water to maintain hydration, without having to administer subcutaneous fluids. In summary, an esophageal feeding tube can be an important tool in providing nutrition and fluids in both short-term and longer-term situations, and is minimally invasive for your cat. If you are having difficulty with assisted feeding, administering fluids, or giving medications, this is a viable option to discuss with your vet. Far from being a “last ditch effort”, the tube can be a vital tool in your IBD arsenal.